Botanically speaking, both the redwoods and the "big trees" are species of the genus Sequoia - a pretty name given to them in honor of Sequoyah, the Cherokee Indian who invented letters for his people. They are both natives of California, the redwoods being confined to the coast ranges and the "big trees" to the western slopes of the Sierra Nevada Mountains. They are dis­tinguished by their peculiar fibrous bark and their rich color of cinnamon brown. 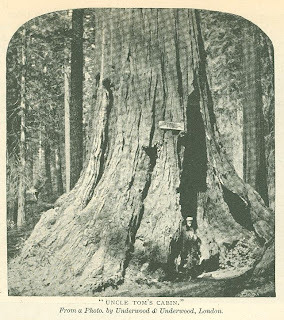 The redwood grows in such large quantities that it is a fit material for commerce, and the red­wood industry of Humboldt County, California, where the trees abound, is enormous. The "big trees," on the other hand, are carefully guarded by the Government. The Mariposa Grove, which contains over seven hundred majestic trees, has been set apart by Con­gress as a National park, and the Government commissioners are able to resist the encroach­ments of every­thing except forest fires, which, at times, have sadly decimated and des­troyed the trees. Many of the trees are known throughout the world by charac­teristic names given to them in honor of popu­lar heroes and favorites of the hour. A section of one of the fallen kings of the Mariposa group is called "Chip of the Old Block," and our illustration gives but a faint idea of what the "old block" must have been in the day of its towering grandeur. Another tree, shown on the following page, has been called "Uncle Tom's Cabin," on account of the tent like opening at its base - an opening in which the stalwart figure of a man is dwarfed. 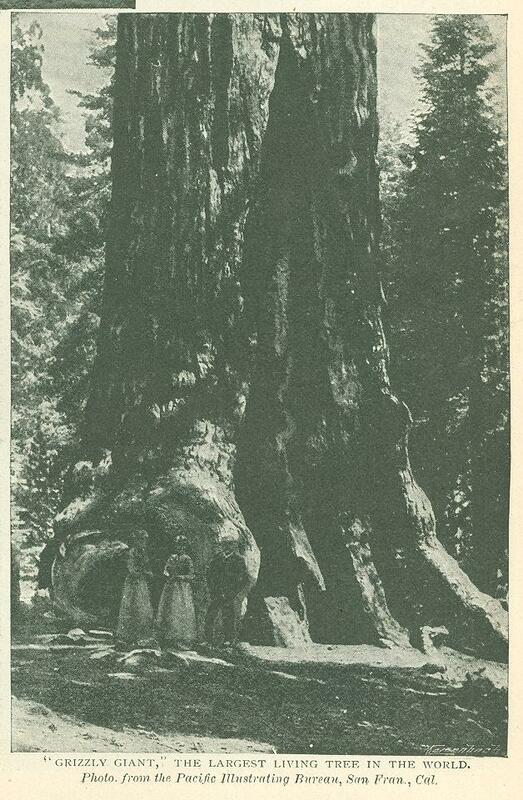 The most famous tree is called "Grizzly Giant," which is over 93ft. in circum­ference at the ground, and over 64ft. at a distance of 11ft. from the base. It reaches a height of 200ft before throwing out a branch, and its first branch is 8ft. in diameter. "Grizzly Giant" is the largest living tree in the world, and stands over 275ft. high. 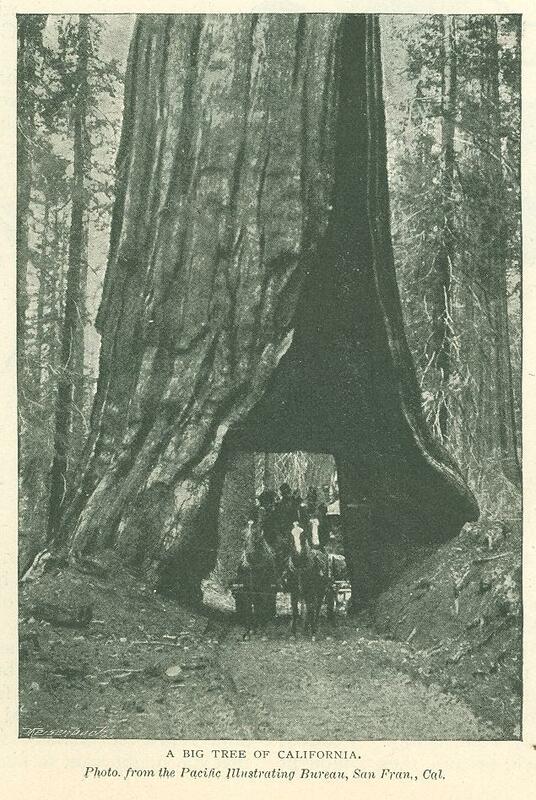 These figures can, however, but barely suggest the mammoth girth of this celebrated sequoia, which people travel from al1 parts of the world to see. Nor can the visitor realize that it and its neighbors have been stand­ing for 2,500 years. Yet such is the estimated age of these forest giants. They were but bushes when Nero fiddled before burning Rome. 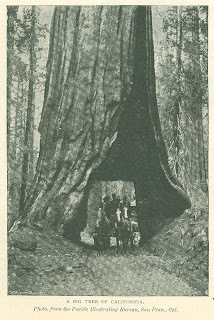 The" big trees" were discovered in 1852 by a white hunter named Dowd, who in that year found himself in the neighborhood of Calaveras Grove. The date 1850 is carved on one of the trees, and this has led many people to think that the big trees had been visited previously to 1852. Since that time, the trees have been one of the remarkable natural "sights" of the United States. Botanists have quarreled over the proper name to give them, and have esti­mated their age from the rings in the fallen logs. 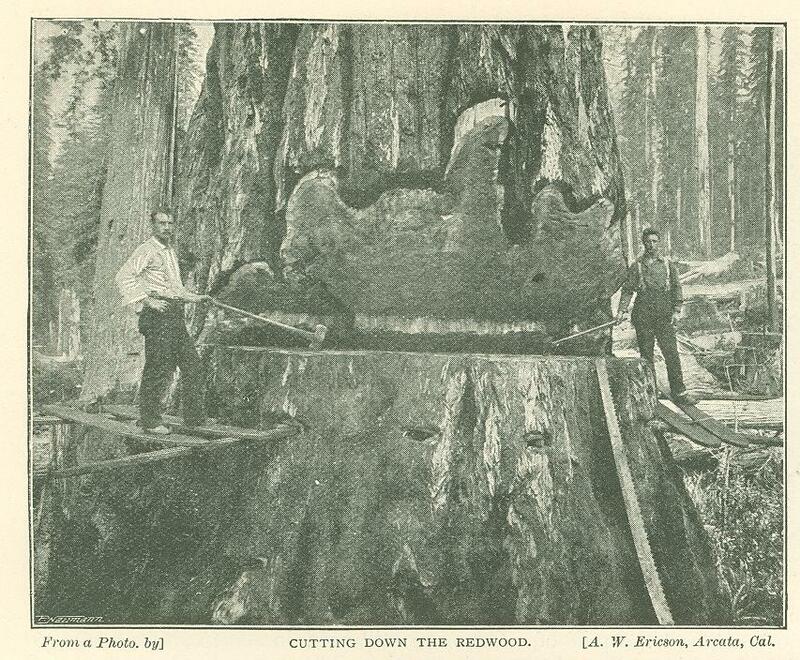 Cross sections have been cut and forwarded to different parts of the country, in order that people might see for themselves that the stories of the "big trees" were true. In Boston, several years ago, one of these cross sections was erected, in a public square, and dances were held on its polished surface. The idea of using a tree for such a purpose originated in California, where a stump of one of the trees has had a house built upon it, to serve as a ball-room. A glance at our illustration of the prime­val redwood forest in Humboldt County, California, the first of several redwood photographs lent to us by the Hum­boldt Cham­ber of Com­merce, will give an idea of the massive trunks of these valuable trees, which stretch out for 100 miles along the coast, "not in sentinel groves," according to a poetical writer, "but in one continuous belt - dense, stately, dark, and forbidding." The forests are apparently imperishable, except through the axe of the woodsman, and this is wielded with care. The trees are never injured by fire. The wood resists combustion, and is hard to burn even when dry. The redwood is the only lumber that can take the place of the white pine, answer as a satisfactory substitute mahogany and black walnut, displace oak for redwood ties, cypress and cedar for shingles, and surpass all other woods for dura­bility when in contact with earth, or when exposed to moisture. These qualities make the redwood industry important to the builders of cities and homes, of rail­roads, flumes, and conduits, to those engaged in mining, manufacturing, and agri­culture all over the country. It is important to the con­sumers, and they should feel as gratified as do the people of Humboldt, that there is still a reserve forest containing 5o,ooo,ooo,ooo ft. of timber, which can be utilized for so many purposes. Redwood will make an enduring foundation, solid walls, and an imperish­able roof. Thus it provides the substantial equipment for any structure. But it may be made to embellish and adorn the home, as well as shelter the inmates. As a finishing wood it is un­equalled, and for cabinet material some qualities of it are superior. Even the stumps, it is said, refuse to perish or even to die, but send forth shoots and sprouts which, if left undisturbed, would renew the forests in course of centuries. With such superb natural resources at hand, it is not strange that the redwood forests should resound with the cry of the lumberman and the crash of the falling tree. With these may be heard the grating of the saw as it cuts its swath through the heart of the tree, the steady c1ick of the axe, the buzzing of fifty saw­mills in the neighborhood, and the puff of powerful locomotives engaged in pulling the heavy logs out of the woods, It is a scene of eternal hurry in the very heart of Nature. In order to cut down the trees, the chop­pers stand on platforms raised around the tree at some little distance from the base. The steady movement of the axe makes a quick impression on the massive timber, but it sometimes takes two weeks for two men to start the tree on its crashing fall to the ground. Most of the unskilled laborers of the county are employed in felling, although even this class of work requires a special amount of skill. The great bulk and weight of redwood logs, and the fact that operations in the logging regions are in progress only during summer months and the absence of snow, make lum­bering in Humboldt differ from the methods used elsewhere. The character of the country, mostly rugged, also in­troduces a distinct element into logging operations. Ingenuity combined with capital has intervened, and almost every extensive red­wood mill plant in Hum­boldt includes several miles of railroad, with locomo­tives, cars, and other equip­ments for transporting logs and lumber, numerous donkey engines for hauling logs out into the road, several miles of electric wire with instruments to supply telephone service to the remotest camps and connect them with the mill and yard, and, in many cases, a system of wire cable on the endless chain prin­ciple, with stationary engine to "snake" the logs to the railway landing. Oxen are still used in some camps, and it is an interesting sight to watch a long string of tugging oxen toiling down through the hills amid a cloud of dust, the logs after them like a gigantic snake. A redwood is ready for the donkey engine as soon as it has been sawed into sections. Chains and ropes are then attached. to the log, and it is drawn through the forest towards the platform cars or trolleys, upon which it is deposited. In the illustration at the top of this page we may see one of these mammoth sections in position on the car. When all the cars are loaded in this manner, they are made up into a train and attached to a power­ful locomotive. A not uncommon sight in the redwood region, but one which, to strangers, would appear remarkable, is illustrated at the bottom of this page, where we get a full view of a train load of twenty-four redwood logs wind­ing slowly from among the hills. By many lumbermen in California the rivers are used with great effect in the trans­port of logs. In the summer the logs are dumped into the bed of the stream to await a winter freshet, which carries the mass along with great speed to the mills, where they lie until they are ready to be sawed. The greater part of the logs, however, are transported by the railways direct to the side of the river or pond, and there shot into the water by means of in­clined ways made of other logs. The logs dash down with great swiftness, and enter the water with a huge splash, casting the spray high into the air with the force almost of a tor­pedo explosion. The illustrations on this page show a log - chute and the magnificent column of water sent up by the diving log. From the log­ pond to the sawmill is usually but a step. In some mills the logs are pulled up on small cars; in others, they are drawn up on greased ways by means of long cables. 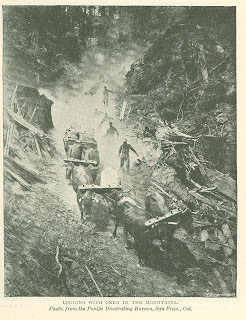 In the forest of the Bridal Veil Lumbering Company, at Bridal Veil, in Oregon, the logs are transferred to the mill by means of a curious railway, illustrated on the following page. The train, so-called, is made up of an ordinary locomotive and a string of logs, each one as large in diameter and some even larger than the boiler of the engine. Boards are nailed to the sleepers between the rails, and on these the logs slide. Except on descending grades, the boards are greased, and the train moves at good speed. Where the road is level or slightly ascend­ing the engine pulls the logs, and where it is descending it holds them back. At the mills of the company the manufactured lumber, regard­less of size, is run into a flume, and this is carried about two miles to the planing mill and shipping yard, the flume descending about 1,200ft. in that distance. One of the great items of expense in the lumber business is the cost of transportation from the forests to the consumer. Huge sums which might otherwise have been left in the pockets of householders have been placed in the coffers of railway and steamship companies. It was in order to lessen the cost of transport that the cigar shaped log ­raft was designed. These extraordinary rafts, of which we give five excellent illustrations, are the invention of Mr. Hugh R. Robertson, of St. John, New Brunswick. The first raft was built at Joggins, in Nova Scotia, and on account of its novelty quickly gained the nickname of the "Joggins raft." It was built in 1887, and its dimensions, of which a fair idea is given in the illustration below, were: length, 560ft. ; depth, 35ft. It took several months to build, and was composed of several hundred thousand logs, closely bound together in a cradle of logs, which rested upon timber foundations. The raft was pointed at one end, and lay on the shore slant-wise in order that it might be quickly and easily launched. During the process of construc­tion the inventor was much laughed at, but, nothing daunted in his scheme, he launched the raft and dispatched it to New York in tow. The first Joggins raft, however, quickly bore out the prophecies of Mr. Robertson's opponents, and came to grief in the wild and wintry Atlantic. The hawser which attached it to the tug was snapped by the force of the waves, the raft burst in pieces, and the huge logs, which represented many thousand pounds in gold, were rapidly distributed over the surface of the Atlantic, to the deep chagrin of the inventor, and the danger of mariners. Notwithstanding this accident, the Joggins raft had really come to stay. A second raft was quickly built in co-operation with Mr. J. D. Leary, and sent to New York, a distance of 700 miles, in ten days, where the lumber of which it was made was sold at a profit enormous in itself, and yet at a price remark­able for cheapness. The much derided inventor made a fortune, and, selling his idea to Mr. Leary, left for the Pacific Coast, where he is engaged to this day in transporting lumber by means of cigar­ shaped rafts with wonderful success. Our last two illustrations show the side and top view of one of these rafts lately built on the Columbia River. Its value was £9,000., and its length 528ft., with the width of 52ft. and a draught of 24ft. The heavy chains, which are so plainly seen in the illustration, enclose 560,000 lineal feet of timber. Originally published in The Strand Magazine. March 1898.